SummerCamp Registration is NOW OPEN! 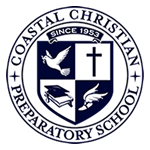 At Coastal Christian Preparatory School our mission is to assist families in raising children to their God-given potential emotionally, spiritually, academically, and physically. We believe this balanced approach gives students a strong foundation for lifelong success. We invite you to come to Coastal Christian and experience our nurturing environment, high academic standards, athletic opportunities, and spiritual emphasis. We would love to show you around our beautiful campus located in the heart of the Old Village! Call 843-884-3663 to schedule a tour. What does Coastal Christian have to offer your child? At Coastal we offer small class sizes to support the individual student. We challenge students outside of the classroom through SCISA athletics and activities. Academic support is offered through the GRACE Program and the Orton- Gillingham Center of Charleston. DRIVEN, our on-site behavior intervention program, offers a plan for student challenges as well. We believe in teaching the whole child and challenging each student to reach their God-given potential within a small school setting. We have adopted Hebrews 12:1-2a (NLT) as our theme for this year. In this verse, “Therefore, since we are surrounded by such a huge crowd of witnesses to the life of faith, let us strip off every weight that slows us down, especially the sin that so easily trips us up. And let us run with endurance the race God has set before us. We do this by keeping our eyes on Jesus, the Champion who initiates and perfects our faith.” —Hebrews 12:1-2a (NLT). This verse reminds us of the importance of maintaining our focus on the Lord at all times, and recognizing that our strength and endurance comes from Him. As we take steps to refocus our focus on the Lord, our purpose and visions become clearer. He clears paths for us even during the most difficult of times and gives us the strength to run the race He has set before us. This is the message that God has placed on our hearts from His Word. Our hope and prayer for this school year is that when times get tough and our patience begins to be tested, we can focus on all the good our Lord has promised us. “Therefore, since we are surrounded by such a huge crowd of witnesses to the life of faith, let us strip off every weight that slows us down, especially the sin that so easily trips us up. And let us run with endurance the race God has set before us. We do this by keeping our eyes on Jesus, the Champion who initiates and perfects our faith.” —Hebrews 12:1-2a (NLT). Looking for something different for your student? Coastal has a lot to offer! Small classes, rigorous academics, missions focus, SCISA 1-A sports, committed, Christian teachers. We use RenWeb as our hub of communications for grades, reminders, enrollment, homework, and more. Click to visit the RenWeb login page. PreK-8 Christian School. Educating students emotionally, spiritually, academically, and physically for a lifetime of Kingdom-building service.